A Queens teenager filmed this stomach-churning video of a rodent crawling over cold cuts at a popular bagel shop in Fresh Meadows last week. Stomach-churning video of a mouse scurrying over cheese inside a deli case at a popular Queens bagel shop has its regulars horrified. 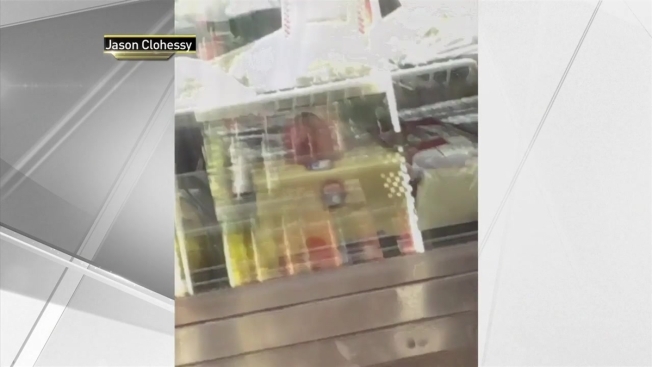 The video, taken by Fresh Meadows teenager Jason Clohessy last week, shows the rodent crawling over a large block of cheese inside the Bagel Oasis eatery on Horace Harding Expressway, then taking stock of the other inventory inside the case. Clohessy says he and his friend were ordering sandwiches and were the only customers inside the shop at the time. He pointed out the mouse to the worker, who offered them refunds -- and the two left. He says his mother filed a rodent complaint with the city. Bagel Oasis is beloved in the neighborhood, but Clohessy says he probably won't return. Clohessy posted the videos on Facebook, racking up nearly half a million views since Wednesday. Longtime fans of the shop were disgusted. "Omg! I will never eat from them again," wrote one woman. "Bagel O used to be the spot," lamented another. "Let's just say they're never seeing me again," said another man. Others seemed to shrug it off, one fan writing, "As long as that little guy didn't go near my strawberry cream cheese." The owner of the shop, who only gave his name as John, says it was an unusual incident, and the mouse may have been brought into the shop during a nightly delivery and somehow got into the case. He said health departments from both the city and the state visited the shop Thursday and Friday, and both departments cleared the store as safe. Because it's a retail food establishment, Bagel Oasis falls under the state's Agriculture and Markets regulations, not the city's health department, which issues letter grades. "Our food safety inspectors did receive a complaint regarding this particular establishment and will conduct a follow-up inspection of the facility," said Agriculture and Markets spokeswoman Jola Szubielski. A spokeswoman for the New York City health department also said it takes rodent complaints seriously and was sending an inspector as well.